Let me tell you about one of the most incredible experiences in my life. It just happened a couple of days ago, and I still can hardly believe it. Wednesday was the day of my first Alvin dive, to survey the sites we will be studying during the cruise, collect samples and deploy experiments. I won’t lie, I was a bit nervous. Let’s say 25% nervous and 75% excited. But as soon as the pilot Jefferson Grau closed the hatch, it was just magic. I don’t snorkel or scuba-dive, so being under water close to the surface was already somewhat new for me. What struck me during the first minutes of our dive was the colors, from a very clear blue at the surface, to a darker and intense blue at around 50 m, to almost green. At around 200 m depth we exited what is called the euphotic zone, the zone of the ocean penetrated by light. From that point on, there is eternal darkness. In the dark, we could enjoy the show of many bioluminescent organisms of various sizes, emitting light when the sub disturbed their peaceful life. It felt as if you were looking at a galaxy with moving stars all around. 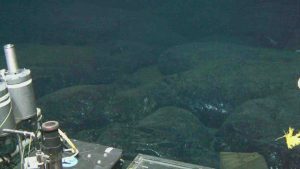 After about an hour and half, we finally reached the bottom, at 2,500 m depth a little off-axis from the vent sites. There is the realm of geology. The bottom of the oceans looks like stone-made big pillows. Some of them collapsed, and you can see they are hollow. The fresh basalt from recent lava eruptions looks black and shiny compared to the more ancient crust that is already starting to be covered by sediments. We proceeded to the vent sites we study, with names like Crab Spa or Teddy Bear – scientists do have a sense of humor! And there was the real apotheosis of this formidable voyage. 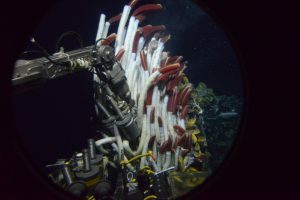 Life at deep-sea vents is incredibly diverse and active, with fish, mussels, crabs, shrimps and of course the beautiful red-and-white bouquets of Riftia tube worms. 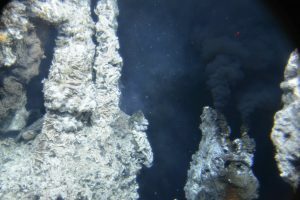 And all this life depends on tiny chemosynthetic microbes that are able to get their energy by oxidizing reduced vent fluids to build biomass. This is the realm of geology colonized by biology! We collected pieces of chimneys, Riftia and fluid samples, and deployed several experimental devices that will be recovered later during the cruise. After 5 hours spent at the bottom of the Pacific Ocean it was already time to start our ascend back to the surface, the eyes full of amazing pictures. 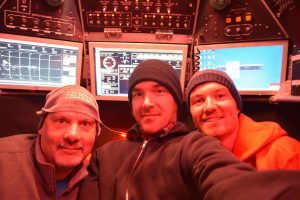 All my thanks go to the Alvin and Atlantis crews, our great pilot Jefferson Grau and of course the chief scientist Stefan Sievert for giving me this unique opportunity to share such an incredible journey with him. Witnessing the peacefulness and beauty of the remote world at the bottom of the sea is indeed a life-changing experience.